It seems that every few days, an unfortunate hate crime against Muslims is once again reported in the media, making safety for Muslims – and particularly for Muslim women – a very real concern. When we read about these chilling events, many of us respond with sympathy for the victims and deep concern for our Muslim brothers and sisters around the globe. However, it is vital that Muslim women also consider these racist attacks as a personal wakeup call. 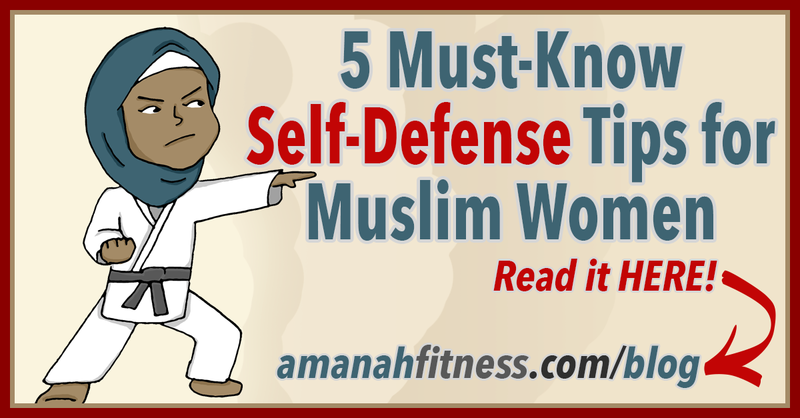 Use these 5 essential self defense tips to stay safe, sisters. Mental Preparation is Key — STAY ALERT & AWARE. However, we must understand that rare events CAN happen to any one of us in order to be prepared and ensure our own safety. Ask yourself the question: Do YOU know what you would do if you found yourself face to face with one or more attackers screaming racist profanities at your face, and charging towards you? By mentally preparing yourself NOW, you can reduce the effects of fear paralysis and shock in the unfortunate event of an attack. If you are completely confident that your daily walking routes are “safe”, you may drop your guard and become a more likely target for attack. Being ALERT is not just a verbal warning that your mother calls at your back as you leave the front door. Being alert is ACTIONABLE. Do NOT lose focus when you are by yourself in public places, EVEN if there are other civilians around you. Do not chat on your phone, check text messages or plug in your headphones while you are walking, standing in line, waiting for the bus, or sitting in a train or in the subway. Even if your headphones are hidden under your hijab and no one can see them, they can distract you from your environment. PAY ATTENTION to the people and places around you. Walk wide and away from building corners and dark areas to avoid a surprise attack – even in broad daylight. Scan the streets in front of you and the people walking towards you. Always gravitate to areas in which there are larger groups of people and walk at a fast pace with confidence and caution. Ideally try to always travel with a partner or in a group. Do not look distracted, absent or idle. If you are aware, you not only identify potentially dangerous situations and avoid them, but you also make yourself a less convenient target. 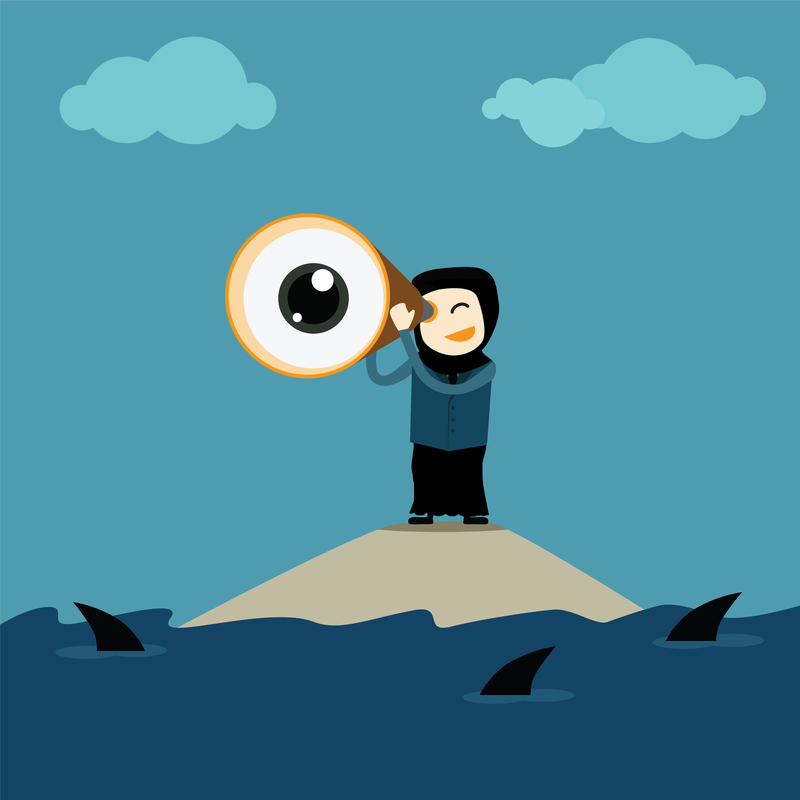 Don’t be distracted – you never know what danger you could be missing! Be hyper-vigilant for how you look and dress as a target. Imagine how you might appear to a violent and racist person on the street who hates Muslims. Even if an attack is not premeditated, if a hateful person sees a Muslim woman who could make a convenient target, they may be motivated to attack. Your choice of footwear is particularly important. If you are tiptoeing on narrow, uncomfortable shoes, your means of an explosive escape from potential attackers is slowed. Try to avoid high heels because you could roll your ankle while trying to run. Many women wear also loose flats that slip off your feet with every step you take. These make running difficult and could trip you if you need to escape. Winter is coming, so it should be easy to go for close-toed, fitted shoes that can move easily with your feet in an emergency. Save your fancier shoes for later, ladies. Keep your feet comfortable and mobile while in public. Always keep your eyes in front of you. Remain mobile and unhindered in public. If you are shuffling through your purse or backpack, your head is down and you are not alert. These brief moments of inattention to your surroundings may be enough to make you a target. If your hands are full of bulging grocery bags, your movements and reaction times are slowed, and you become a more convenient target for attack. Try not to carry large tote bags or purses, which are convenient items for attackers to grab onto and yank you off balance. Carrying bulky or heavy items that reduce your mobility may motivate an attack from a hateful person. If you have a lot of groceries to buy or need to carry a lot of items, take a friend or take a car. For students especially – do not walk home from your local Metro or Fortinos lugging several bags of food with you. ALWAYS stay mobile and keep your arms and hands accessible. Stay vigilant at all times to avoid danger! If you find yourself in a dangerous situation, never try to “win” against your opponent. Your focus is to protect your life, and the most reliable way to do this is to escape your attacker. If you feel threatened, exit the area by initially running as fast as possible, preferably to a safe, well-populated and safe public area. Get away from from moving vehicles that you could be pushed into. Focus on CREATING DISTANCE and ATTRACTING ATTENTION. Don’t worry about embarrassing yourself – attract attention of others by shouting for help if you feel endangered, or duck into a populated store, mall or restaurant. Remember, remove yourself from the situation FIRST before calling the police or using your cellphone to communicate with anyone. Your first priority is to get yourself into an immediate safe-haven, and then coordinate how you will get home, next steps, etc. Make sure you are 100% safe from potential attackers before dropping your attention to your phone to call for help. AVOIDING the situation is the best defense. If you find yourself cornered in an attack, execute a SIMPLE defensive STRIKE using your BODYWEIGHT to create an OPPORTUNITY TO ESCAPE. Many people think that in an attack, you should focus on defending yourself or blocking your attacker’s moves. What do the pros recommend you do to defend yourself? Many self-defense classes teach you to react to an attacker’s actions. This defensive thinking can make you hesitate (“What is he going to do to me?”), lose focus (waiting to get hurt makes most people freeze), and ultimately be one step behind the attacker. IF you are cornered with no means of escape, be prepared to make one SIMPLE, EFFECTIVE defensive strike and then run as fast as you can. You don’t have time for any fancy techniques or precision! Aim for the eyes, nose, throat or groin. The objective is NOT to just cause some pain to the attacker – the objective is the INJURE the attacker momentarily and create an opportunity for you to RUN and ESCAPE. You want to throw your body weight behind your attack and connect with their body using an elbow or knee to create your opening to escape with your life. Your elbow is one of the hardest parts of your body to use to protect yourself. Leverage your weight no matter how small you are to concentrating your strike in one area, and get away while your attacker is momentarily incapacitated. Always look for your opportunity to ESCAPE. If there is no opportunity, create it. We all know that running away from a dangerous situation is the best defense. According to the National Council on Strength and Fitness, “the average man can run about 15 mph for short periods”. In an emergency, do you have the cardiac capacity to be able to escape from an attacker? And, do you have the endurance to be able to make it away from a dangerous situation into a safer location? Dear sisters, of course, avoidance is the best way to keep yourself safe. Always travel in groups and avoid dangerous areas. Remember your adkhaar in the mornings and evenings. However, it is just as important to maintain your body to ensure that if you need to escape from danger, you are physically able to do so. Strengthening your heart through aerobic activities will improve your ability to run and escape danger. Spending just a few minutes a day doing effective, well-planned exercises will increase your endurance and stamina no matter how young or old you are, so you are better able to defend yourself and escape from any situation, inshAllah. Even if you don’t love to run, you can still build up your endurance with some of my favourite at-home cardio aerobic exercises! 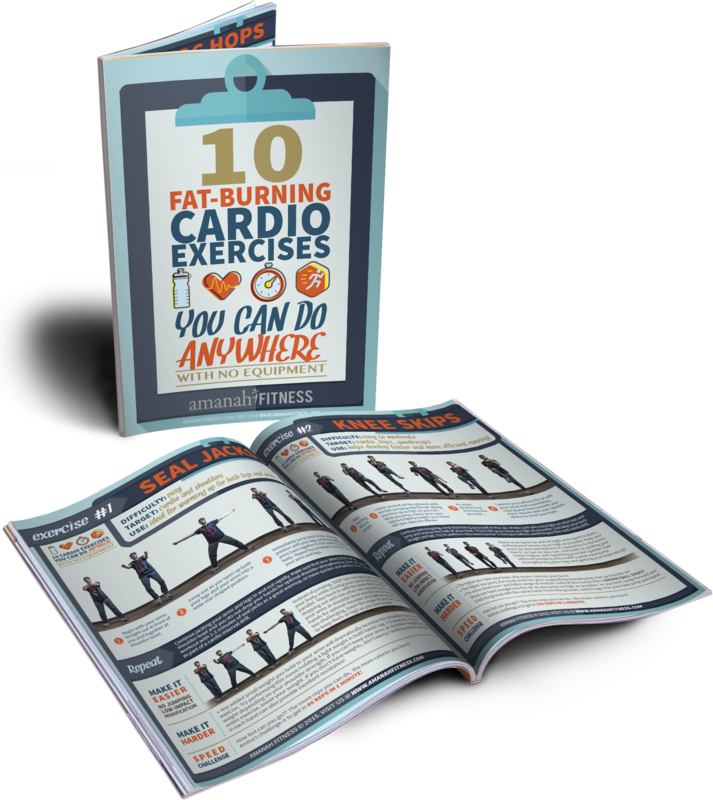 Click here to download my FREE exercise guide with 10 cardio exercises you can do ANYWHERE without ANY equipment. Practice these exercises regularly to improve your cardiac capacity, endurance, and stamina, to prepare yourself before you ever need to use any of the tips in this guide, inshAllah. 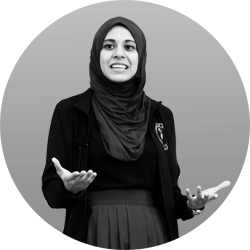 Amina Khan is a CANfit-PRO Certified Group Fitness Instructor Specialist and founder of Amanah Fitness. She is currently pursuing her Ph.D. in Health Psychology at Walden University. Her mission is to help others improve their health, via physical exercise and nutrition programs that are practical and life-changing. 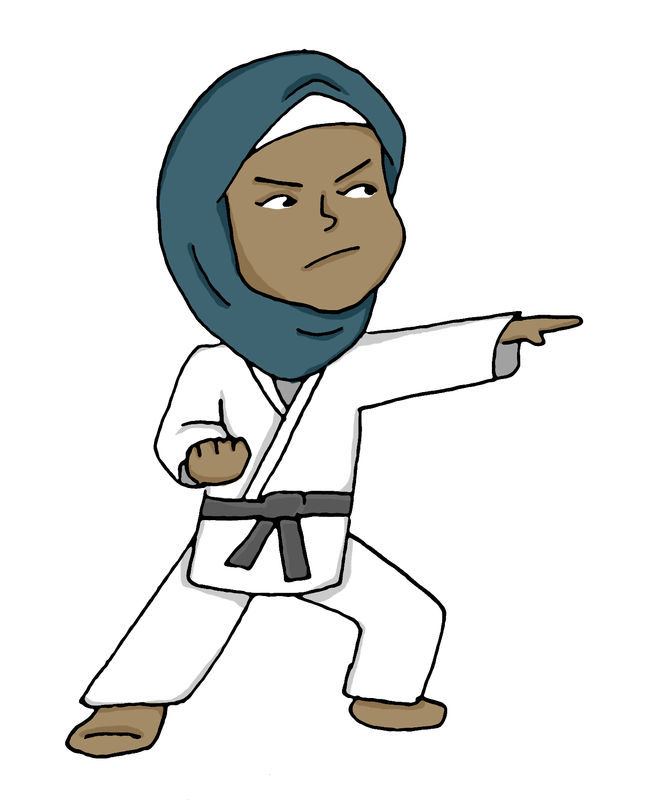 Amina’s goal is to spread the message that physical health is a component of enhanced spiritual health and a part of being a Muslim. She hopes to create a mass movement towards a healthier Ummah, inshAllah. Click here to download her Free Exercise Guide to get you burning calories with cardio intervals!